It's Fall, which means it's football season. If you're in or around Indianapolis, chances are that you are a Colts fan just like we are here at Home to Indy. One of the best ways to celebrate your new home is to have people over. So why not host a Colts party? If you're not able to be at the game, the second best thing is to recreate the energy surrounded by your closest family and friends. 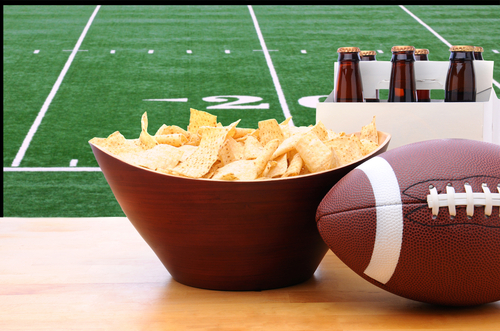 But in case you're not a natural party planner, here are a few tips to creating an awesome Colts party. Send invitations (digital or snail mail) to your neighbors, family, and friends. Create football-themed invites that look like actual tickets. (You can order some personalized ones online here.) Encourage fans to wear their best Colts gear - or go over the top with blue and white (then have a contest for the best dressed). Make sure you give your friends plenty of time to plan ahead so that they can make it to the party. Set up a photo station where guests can take goofy pictures of themselves. Have Colts jerseys, helmets, footballs, pompoms, hats, cheerleader uniforms, referee shirts, goofy glasses, wigs available. The crazier, the better! On the other hand, you can also do something easy like throwing some hotdogs or hamburgers on the grill - or putting some chili in the crock pot. If you've just moved into a new home, don't feel like you have to provide all the food yourself. A pot luck is an easy way to eliminate some of the cooking stress. Create some healthy competition between your fans. Have a sign in sheet where guests can fill out their name, who they predict will win, and the final score. Have a fun prize for the winner. What better way to entertain your guests than to have our beloved mascot Blue show up? (Obviously, this would only be available during away games.) He can be hired to make an appearance, during which he could sign autographs, throw a football, and make everyone laugh. Keep in mind, they ask for 4 weeks' notice for your request. With Blue, it's sure to be a game that no one would forget! For the Homegating Guide, visit the NFL Pro Shop and check out your local Bed Bath and Beyond for more Colts party items. GO COLTS! What did we leave out? Write a comment in the section below - we'd love to hear your great ideas!